Are you always searching for a great new math activity? This order of operations “Capture It!” game makes kids think as they exercise mental math skills. Also, it’s fun! The game is easy to prepare (simply copy and cut). Once you have made however many sets of cards you need, the game will always be ready to use … all year long! It works well for early finishers, to provide extra practice with order of operations, as an activity for a substitute teacher, or on the day before a vacation. Students race to “capture” a target card. Each player in turn will roll all three dice. 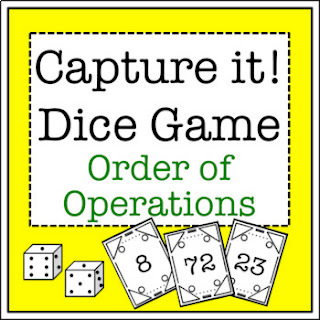 Then, all players will try to get one of 12 target numbers by using the three numbers on the dice along with the order of operations. (Example: If the numbers rolled are 5-5-3, a student could “capture” target card 20 because 5 x 3 + 5 = 20.) Younger students may just use addition, subtraction, multiplication, and division. Older students could also use exponents, such as 53 – 5 = 120, to “capture” target card 120. Detailed instructions are included in the FREE DOWNLOAD. I hope you enjoy using this game for years to come!